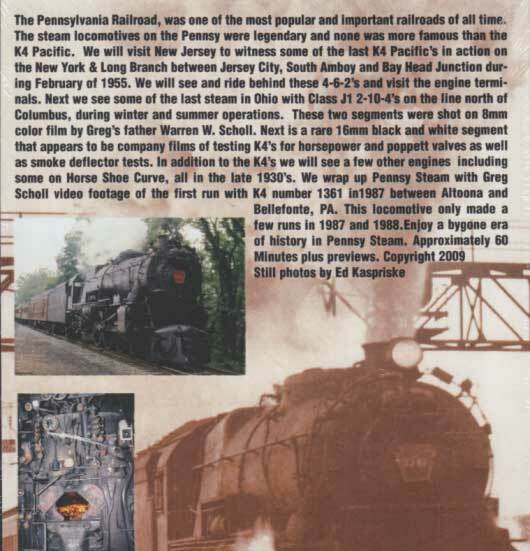 We always wanted to do a Pennsylvania Railroad video, but never had quite enough material to put one together. However with some interesting Black & White footage we obtained and the 1361 footage we have a nice variety of steam to offer. We begin with riding a diesel passenger train to New York in the winter of 1955, then see lots of K4 action between Exchange Place, South Amboy, and Bay Head Junction New Jersey. This was the last stronghold for K4 Steam passenger operations on the Pennsylvania. We see mostly riding footage, but also stations, terminals, and some trackside scenes. Next we go back to Ohio and see two different visits to the PRR line from Columbus that ran north toward Sandusky, Ohio. The power is the huge J1 2-10-4 locomotives which are seen in winter and summer, and with one engine and doubleheaded. After this we show some very unusual rare Black and White footage shot first on Horseshoe curve in the late 1930's, then head to the Altoona test plant for K4's being tested with new valve gear and for smoke deflectors. This is some very unusual footage, and includes some camera mounted shots atop the boiler of a doubleheader, and and engine with cylinder damage. 70 years old, and even the K4 footage is 22 years old when we release this video. The K4 footage was in a VHS release we did called "American Steam Volume 1" but this is the only place you will find it on DVD. Vintage film segments have music and informative narration as no sound ever existed with these vintage films, and the 1987 segment has live train sounds. Steamboy (Revere MA US) on 2016-08-17 13:24:35. While 2009 marks Greg's 25th anniversary of the railroad video business, He decided to Re-edit and convert some of his VHS only products to DVD. One of them Called "American Steam Volume 1" From 1989, Was now broken up to have the segments from that video on its own related themed shows. The 1361 segment was on that tape, and By using his Father's (Warren W. Scholl) Silent 8mm films, as well as the 16mm B&W company films, this is what celebrating 25 years of him are all about.